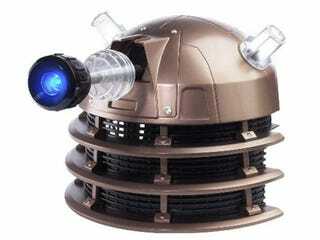 The popularity of the hideous Dalek Sec Hybrid Mask last year proved once again that Dr. Who fans are a loyal bunch. Soon, these fans will be able to strike fear/laughter in the hearts of their enemies once again by donning this dapper Dalek voice changing helmet. Naturally, you will be able to run around yelling "EXTERMINATE" with the classic cold, robotic tone—but you will also be able to play back recorded Dalek phrases or activate the exterminator sound. But before you get too excited, check out the image after the break to see how un-cool you will look wearing it.